We are delighted to announce that our smart-scales will prevent food waste in 500 sites, across Compass Group UK and Ireland. The announcement happened last month during an event at the Wellcome Trust, one of Compass's most iconic sites. Guided by chef Chris Arkadieff, attendees had a chance to see how the Winnow system has helped the kitchen staff reduce over 50% of their food waste. Food waste is a major global issue. We are on a mission to help the hospitality industry cut down on food waste by making the kitchen smarter. Compass Group UK & Ireland, UK's largest contract caterer, has been a key partner since Winnow was launched four years ago. We have worked together to create ground-breaking new technology which has the power to revolutionise the hospitality sector by reducing food waste. Now, the Winnow system is present in 25 countries, preventing 1,000 meals from being wasted every day. Compass Group is leading the way to respond to accelerating demand from customers and to cater responsibly sourced food. Last year the catering giant launched an inspiring corporate social responsibility report, in which they commit to playing their part in creating a sustainable future. Among other initiative and targets, they have pledged to reduce food waste by 10% by 2020 as part of the company's commitment to become a truly sustainable business. Compass has trusted us to help them achieve their target. Easy to install, fast and simple to use, the Winnow system has been implemented across all key areas of their business. From staff restaurants, to universities, and even military bases. Winnow works in all types of busy kitchens, and the staff can easily integrate the tools into their work routine. Research by WRAP has found that 18% of all food purchased by the hospitality sector is wasted. However, with Winnow, Compass Group UK & Ireland waste significantly less than the industry average already. Compass Group is not alone. Fellow Winnow partner, AccorHotels, has also set a bold target of reducing food waste by 30% by 2020. To achieve this, they commit that sites will measure their food waste by value and use that data to drive change. 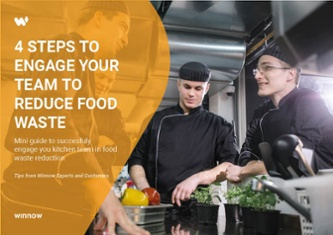 Internal trials with Accor Hotels have shown that sites which adopt these measures can cut food waste by 50% by value. Forward thinking organizations are waking up for the opportunity lying in food waste reduction. It is clear that by preventing waste from ending up in landfills, business can save money, contribute to environment and set themselves ahead of the competition by raising their profile as a sustainable brand.